We’re excited to announce a partnership with Truecaller (one of the world’s largest mobile identity platforms) to allow more merchants across Africa accept payments online in a frictionless and secure manner by leveraging Truecaller’s mobile identity product, Truecaller SDK. Paystack has just announced the launch of Paystack Starter Businesses, a merchant tier that allows businesses to start using Paystack without the need for a corporate bank account or company registration certificate. Using the Truecaller SDK, Paystack is able to verify the identity of Starter Business merchants by verifying their phone number. This is in addition to proprietary risk checks that Paystack runs. 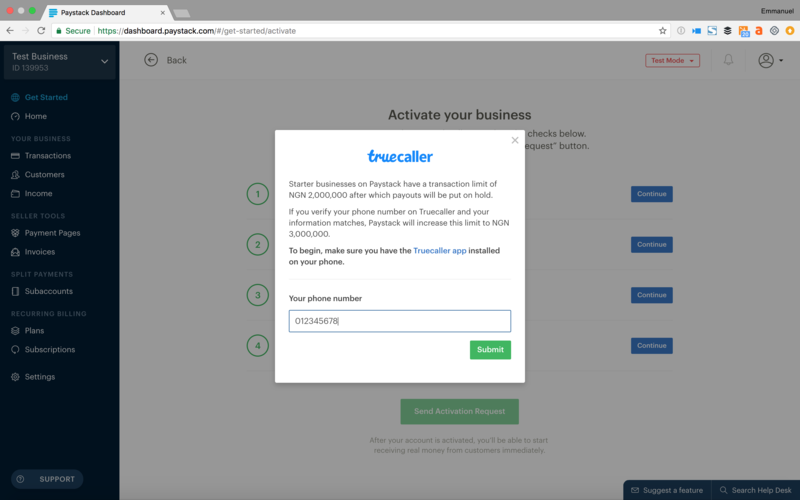 Starter Business merchants usually have a collections limit of 2 million Naira applied to their businesses, but merchants who opt into phone number verification via Truecaller enjoy an increase of the limit to 3 million Naira. 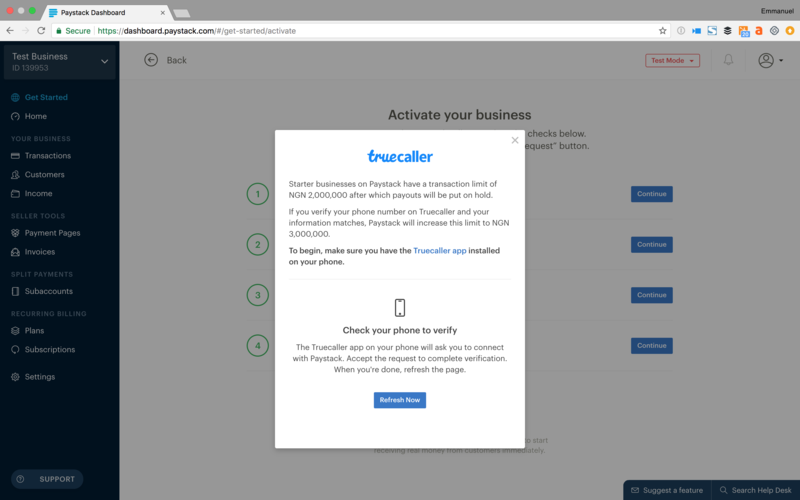 Let’s use the Paystack Starter Business merchant verification as an example of the Truecaller SDK in action. A prospective Starter Business merchant is attempting to activate his business on Paystack. He sees that he can verify his phone number with Truecaller. When he checks his phone, he sees a prompt from Paystack to verify his Truecaller ID. Clicking on the green button completes the verification. Paystack merchants such as Branch, Aella Credit, and Piggybank currently leverage these tools to power their business. 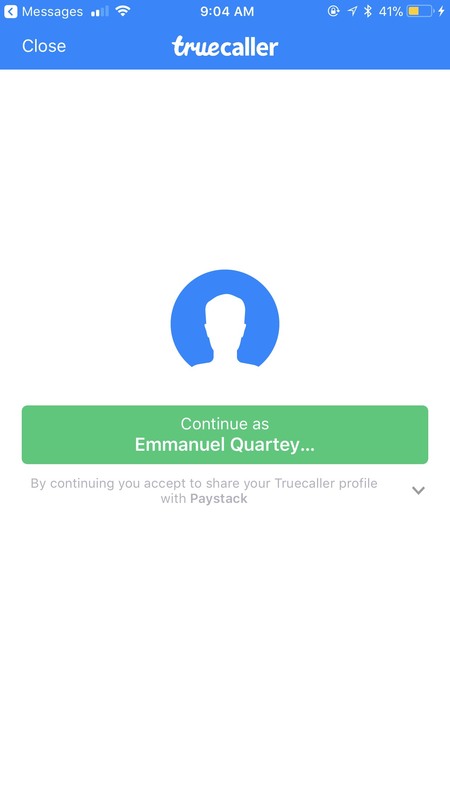 Thanks to the partnership with Truecaller, Paystack is now able to offer a fourth, brand new verification option - phone number verification - using the Truecaller SDK, that works for customers all over the world! 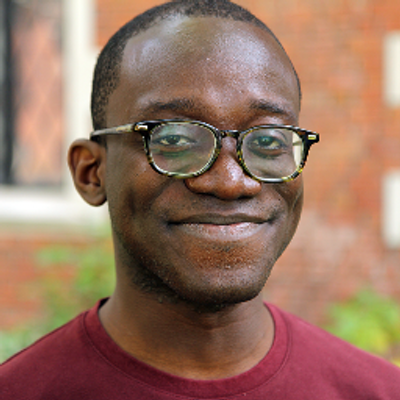 Say you're a Paystack merchant who has a lending app, and you'd like to verify the identity of the people to whom you're giving loans. With phone number verification powered by the Truecaller SDK, you can give your customers the option to confirm that they are who they say they are by submitting their phone number. When the customer initiates the phone number verification, they receive a prompt on their Truecaller app, asking if they accept the request to verify via Truecaller. Once the customer taps "Accept," the requisite information is passed on the merchant, who is then able to confirm the customer's identify against other submitted information. In case the user changes their mind and no longer wants to verify, they can immediately reject the prompt. In our announcement about Paystack Starter Business, we mentioned that the mission of Paystack is to help businesses in Africa be profitable, envied, and loved. Today, the way we do this is through a kickass payment gateway, but we have our eyes set on an entire suite of tools to help our merchants grow. Those tools include verification APIs that allow our Paystack merchants verify the identity of their customers. In low-trust environments like Nigeria, such tools play an important role in powering a vibrant online payment ecosystem. Over 50 million Africans use Truecaller. As Paystack gears up for a wave of expansion across the continent, we’re thrilled to have a partner like Truecaller enabling tools that increase trust, and helping support our vision of frictionless payments across Africa, powered by Paystack! We’re thrilled to announce that we’ve hit our next transaction milestone: customers are now using Paystack to pay over 10 billion naira (~$27.5 million) to Nigerian merchants, every month.